18 jan 2018 - Wat voor beleid en projecten kunnen we ontwerpen om stedelijke ruimtes meer adaptief te maken voor energie, afval en watergrondstoffen? Daarover bogen 3 experts zich. Hun conclusie: een sluitende businesscase en hulp van de overheid zijn cruciaal. Vorige week startte in Amsterdam de sLIM-reeks 2018, een serie lezingen met als thema ‘Transformatie van de stad; van idee naar praktijk’. De lezingen worden georganiseerd door de UvA, Praktijkleerstoel Gebiedsontwikkeling TU Delft en stichting Leergang Intensief Meervoudig Ruimtegebruik (sLIM). Tijdens de eerste bijeenkomst ‘Circular flows and urban change’ spraken Professor Herbert Girardet (World Future Council), Professor Ellen van Bueren (TU Delft) en Mari van Dreumel (Ministerie van Infrastructuur en Milieu, Nederland circulair in 2050) over de impact en praktijk van circulariteit principes in stedelijke ontwikkelingsgebieden, huisvesting en openbare ruimte. Hun belangrijkste conclusie: we hebben door beleid gestuurde verandering nodig, want de markt gaat het niet vanzelf doen. De circulaire economie vraagt om een systeemverandering, iets waar de overheid aan bij kan dragen belastingstelsels op te zetten die de circulaire economie stimuleren. Daarnaast is het creëren van een sluitende businesscase van belang voor het echt van de grond krijgen van circulaire gebiedsontwikkelingen. Dit verslag is alleen beschikbaar in het Engels. What type of policies and projects can we design to make urban space more adaptive to energy, waste and water resources? In the sLIM-lecture series 2018 we explore the impact and practice of the principles of circularity in developing urban areas, housing and public space. In the first lecture of this series “Circular flows and urban change”, three speakers talk about their experiences with circularity in science and in practice. 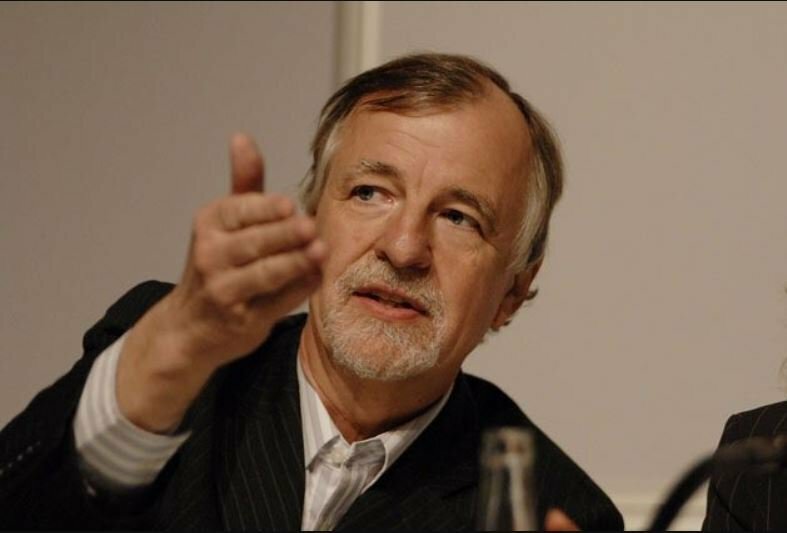 Professor Herbert Girardet (World Future Council) tells that we moved from a ‘Agropolis’, the traditional town embedded in its local landscape, to the ‘Petropolis’, the modern city that emerged during the 19th century and is depending on fossil fuels for production, consumption, and transport. Due to fossil fuels the city is able to grow. In 120 years human numbers have increased fivefold – from 1.5 to 7.5 billion people - while urban population increased fifteen-fold. This urban growth increases the resource consumption. Generally spoken the increase of living standards when living in cities goes together with the increase of human impact. Professor Girardet shows that cities, located on 3-4% of the land surface of the earth, use 80% of its resources and discharge the bulk of solid, liquid and gaseous wastes. So cities are dependent systems, since they require resources from distant places. Since the start of the 21st century we are working on an ‘Ecopolis’, an ecologically as well as economically restorative city. It proposes a new integration of the human habitat within its local environment. A new emphasis on regional food needs to be augmented with local, renewable and modern energy supplies. Urban designers focus too much on urban structures, says Girardet. They say: if we densify the city, we are sustainable. According to Girardet this is a limited view, since the metabolic processes define urban impact. 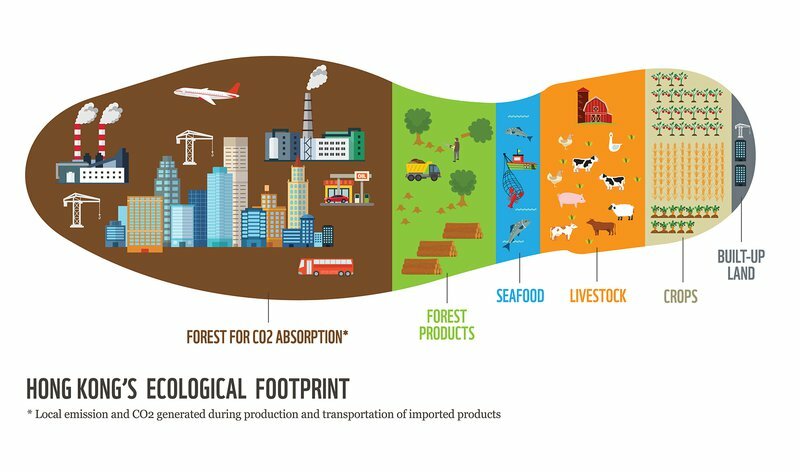 He explains this by showing the ecological footprint of one of the most dense cities in the world, Hong Kong: its ecological footprint is 540 times larger than its surface area or 5 global hectares per capita. This means that if everyone in the world lived a Hong Kong lifestyle, we would need 2,6 planet earths. And if everybody lives like people do in the Netherlands or in London, we need even 3,5. For creating a more sustainable world (ie staying within the boundaries of our planet), China plays a big role. From 2000 to 2010, urban centers expanded by over 80%, proportional to an area of farmland half the area of the United Kingdom. China is reconsidering its cities. Eco-sustainability becomes much more important in Chinese planning. The Chinese government decided to establish permanent farmland belts around 14 of the country’s biggest cities, and soon around smaller cities as well. These areas will be off-limits for commercial development. But prioritizing sustainability at the expense of growth continues to be a contentious issue. The public asks Girardet what the first step would be to work on the circular economy. In general, energy and urban food supply are important ones. We have to look for ways to revive urban agriculture at the edge of cities, he answers. Therefore it is urgent to create incentives, which means regulation. For example, European legislation plays a major role as incentive for urban decision makers. To round up, politics is noted as the big elephant in the discussion. You need policy-driven change. The market won’t do it. In European politics, the long-term perspective is not that well represented. The raw materials that we import from China are too cheap. Hence, the government should put a limit to the import of these goods in order to create its own circular economy. Professor Ellen van Bueren (TU Delft) presents the state of the art of implementing circularity in urban area development by speaking about the expectations and challenges that we face with regards to the circular economy. Van Bueren explains that we are still looking for the meaning of circular economy and circularity in area development. One of the strengths of the concept of the circular economy is that, instead of pushing the governments to formulate sustainability ambitions, it really connects to the frame of private industries, since it has this economic competitive dimension of acting responsibly and sustainable. 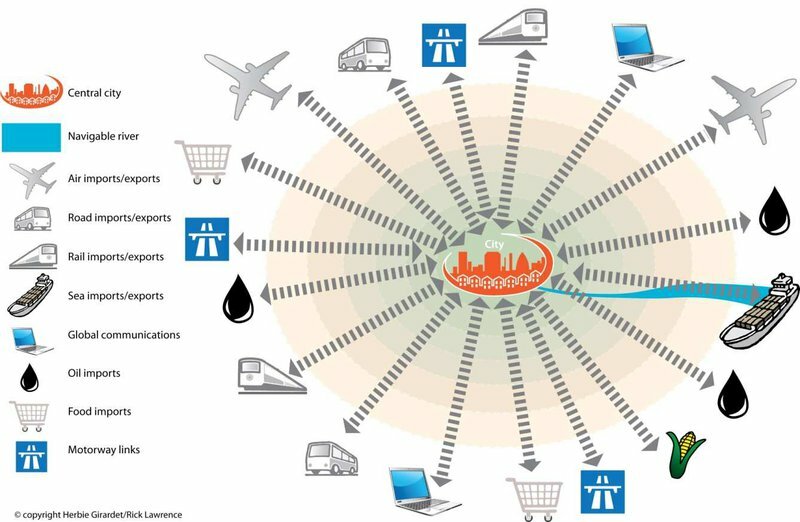 Amsterdam is considered as one of the frontrunners in a circular economy. Van Bueren refers to the graphic of Herbert Girardet shown below, with the concentric circles around the city that show the impact on the hinterland of all these processes. It emphasizes the urgency to close our loops, reduce the input and output and use the resources in the system as efficiently and productively as possible. Van Bueren adds that from an urban planning point of view this is also very challenging. 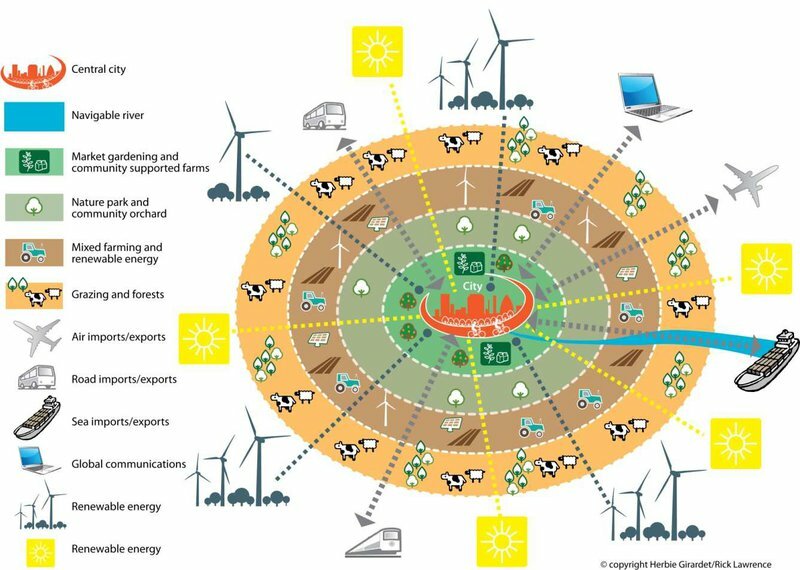 It looks very simple on this graphic, but can you just put this picture on top of a particular area, for instance the development of Haven Stad in Amsterdam? What do you have to do to make it work? These are some of the many questions that many people involved in urban development projects are intrigued by. Ellen van Bueren highlights 3 larger urban area developments: Buiksloterham and Cruquius (Amsterdam) and Binckhorst (Den Haag). The Buiksloterham is characterized by multiple circular projects. It is an urban area that was supposed to be developed already ten years ago, but which didn’t due to the financial crisis. The former industrial land has a lot of property developers and housing associations that already got a position to build, but they couldn’t afford it anymore. As a result, a vacuum appeared. At the same time this gave room for some other initiatives by people that were already present in that area, such as inhabitants and small companies. After that, new people came that purchased some of the self-built housing plots. They turned out to be very innovative, got together and pushed for circular ambitions of this area. They organized roundtables with everyone involved on energy issues, waste issues, water management and economic issues. This created a good atmosphere, including some very nice initiatives like De Ceuvel: house boats that have been put on shore. In this particular project volunteers were involved and the consulting and venture building company ‘Metabolic’. These ideas came forward through a tender formulated by the municipality as “a good idea for temporary use of this highly polluted land”. Local input – output analysis Buiksloterham. Source: Metabolic. Another example is the Binckhorst in Den Haag. This is an area enclosed by infrastructure, including some small and medium sized enterprises. The developers hired Ger Brouwer as a resource broker, which is a new type of policy instrument. His job is to make areas as resource efficient as possible. He mapped the resource flows: what kind of waste could be used by another company? He came up with the idea to make a recycle point for construction materials. This is often done in circular area development. There are also some companies that try to make a business out of recycling construction materials. The last example is Cruquius Circulair, also in Amsterdam. This is a more privately developed initiative. The local companies and people already present in that area came together to find out what kind of resource pulling they could do to increase efficiency and to create jobs within the area. 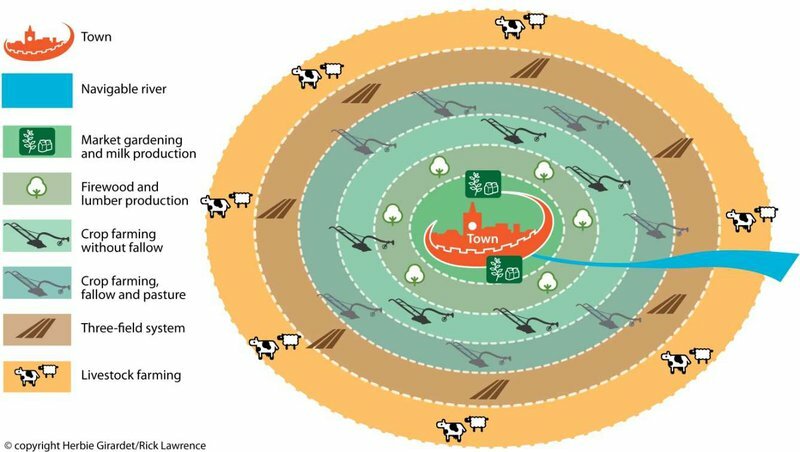 Van Bueren explains the approach in areas that are to be developed in a circular way. One of the first actions is a local input-output analysis. This shows where the big losses are and where the big efficiency gains can be made by coming up with smart connections. The next step to be made is even more challenging. The local input–output analysis is based on an aerial point of view, but what does it mean from an urban planning/design point of view? Van Bueren tells that nobody actually knows; it is a completely different way of thinking. The flows where the input and outputs come from are global, not local. Material flows have their own economic rational and own organization as well. Van Bueren emphasized the urge to include urban designers, spatial planners, sociologists and artists in the search for a circular economy. This is because there is also the behavioral dimension, and not just the technical side. If we keep consuming in the way we do now, we will not get far in a circular way of living. The bathtub of investment. Source: Friso de Zeeuw. She rounds up by highlighting the missing business case in large scale circular urban area projects. The diagram of Friso de Zeeuw, with the bathtub of investment needed to develop large urban projects, show that you need to make very big upfront financial investments to start these projects. It is hard to get these investments in line with the circular principles if we don’t change some of the other conditions in our economy. One question is about the main reason that private companies don’t want to take risks. Van Bueren explains that every action done by private companies which is different from what they usually, costs them money or is a risk. Hence, the whole financing structure of how these projects and companies are being financed should change. This means that lots of other stakeholders must get involved as well. In small scale projects the risks are smaller, so they tend to happen more easily. Van Bueren adds that it will be very interesting in the coming years to see the development of projects like the Binckhorst and Haven Stad. They are bigger scale projects with lots of traditional actors on board that are aware of the need to change and realize circular ambitions, and they are looking for ways to do so. We end up on the national scale with the last speaker Mari van Dreumel (Ministry of Infrastructure and Environment, Circular Netherlands 2050). He is working on the National Program Circular Economy. 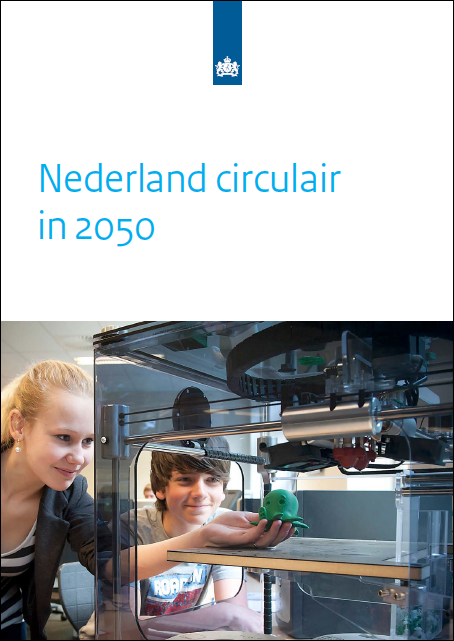 In this program, the Netherlands have formulated its ambition to have a circular economy by 2050. Van Dreumel states that the circular economy appeals to different actors; to the market, to the people and to the government. One year ago the National Agreement on Circular Economy has been made. It is a start of working together to accelerate the transition to a circular economy. The goals for 2030 and 2050 are not accountable objectives. Such ambitions help to program the work to be done. All signatories are involved in developing transition agendas and contribute to their ability. Van Dreumel tells that companies come to the government to ask for the next step in the circular economy. But the government is also looking for ways how to implement the circular economy on the local level. The government creates instruments to stimulate a circular way of working within companies. For instance, it works on implementing taxes on resources, not on labour. The difficulty for the government is that you don’t want companies to go bankrupt and people to lose their jobs by this new taxation system. Someone from the public points out that the Netherlands might aim to be circular in 2050, but we are very much dependant of other countries. Van Dreumel responds that eventually if you are really circular, you are a closed loop so not dependant on external factors. However, the question is if that is an optimal situation. He concludes with the notion that the circular economy asks for a system change that can be conceived as quite abstract. Hoe pakken we de complexiteit van stedelijke vraagstukken effectief aan? Hoe geven we in de stad ruimte aan de transities van economie, demografie en energie? Flexibiliteit, slimme samenwerking tussen actoren en een interdisciplinaire werkwijze worden steeds belangrijker; hoe doe je dat? Welk instrumentarium zet je in? Hoe komen integrale planvorming en lokale initiatieven samen? Hoe smeed je passende gebiedsallianties? In de masterclass onder leiding van Wouter Jan Verheul (TU Delft): oplossingsrichtingen, analyse, kritische beschouwingen. Hans de Jonge (TU Delft en RCD), Desirée Uitzetter (BPD), Gertjan Giele (Gemeente Den Haag), Wouter Jan Verheul (TU Delft) en Tom Daamen (TU Delft) delen hun inzichten, visie en praktijkexpertise. Bovendien: een bezoek aan Rotterdam Central District, stedelijke gebiedstransformatie in optima forma. De TU Delft onderzocht in het kader van de Agenda Stad van het Ministerie van BZK de voorwaarden om gebiedstransformaties te laten slagen. In het rapport Gebiedstransformaties - Ruimte voor durf en diversiteit worden aanbevelingen gedaan voor een meervoudige en lerende aanpak. De bouwstenen van deze aanpak worden verder uitgewerkt in de masterclass op 8 februari aanstaande. Aanmelden kan nog! Deelname staat open voor alle belangstellenden, deelname is gratis. Stuur een e-mail naar gebiedsontwikkeling@tudelft.nl. De masterclass van 8 februari maakt deel uit van de sLIM Reeks 2018 ‘Gebiedstransformaties’. De sLIM Reeks 2018 is een samenwerking tussen de UvA, Praktijkleerstoel Gebiedsontwikkeling TU Delft en stichting Leergang Intensief Meervoudig Ruimtegebruik (sLIM). De UvA richt zich vanuit de wetenschap op beleidsvraagstukken en conceptuele plannen, de praktijkleerstoel legt de focus vanuit de wetenschap en de praktijk op gebiedsontwikkelingsvraagstukken. De masterclass van 8 februari wordt in samenwerking met de Master City Developer aangeboden. LET OP: op donderdag 22 maart aanstaande volgt de tweede masterclass over gebiedstransformaties. In deze masterclass staan financiering en investering centraal. Noteer de datum vast in uw agenda! Bekijk het volledige programma van de sLIM-reeks hier (PDF).